Collectively, the winter sports teams had one their most successful seasons ever. Almost every team proved that tenacity and hard work pay off, either by the amount of team victories, or an increased number of individual athletes who advanced to regional and state championships. There also was a nice influx of talented underclassmen that, along with their more experienced teammates, proved the future holds much promise for next winter and beyond. Finally, two coaches – boys’ basketball’s Zach Skrinjar and long-time wrestling coach Ron Frank – received well-deserved recognition for their many contributions. The Foxes were section champions, posted their best record in 20 years, and advanced to the WPIAL 6A quarterfinals. All season they were ranked among the top four 6A teams. Coach Zach Skrinjar was named the WPIAL 6A Section 3 Coach of the Year. Shadyside Holiday Basketball Tournament champions. Senior Jake Livingston and junior Carson Cohen were among the WPIAL’s top scorers. Jake and senior Michael Snowball played in the Cager Classic, and Jake was also picked to play on the Pittsburgh Roundball Classic team. Jake and Carson were named first team all-section; Michael, second team all-section; and sophomore Ben Kelly, honorable mention. The transition from club to school sport was a success, with the program posting its best season since the team was formed seven years ago. This group was the largest ever and had the most regional qualifiers in school history. Senior Adam Cook – 3,000 meters; junior Andrew Jeffrey – 60 meters; junior Ben Kronman and freshman Felix Veser – triple jump; and freshman Christian Fitch – mile and 3,000. Also qualifying were the 4 x 200 relay team comprised of Andrew, Ben, junior Ryan Weinberger, and freshman Evan Kieffer; and the 4 x 800 relay team of Adam, Christian, Evan, and sophomore Ian Brown. Junior Caelan Miller – mile and 800-meters; sophomores Annika Urban – 3,000-meters; Sarena Seeger – 3,000-meters and 3,200-meters; freshman Brooke Krally – 3,000-meters; and freshman Grace Sisson – mile. Also, qualifying was the 4 x 200 relay team of junior Lainey Kasian and sophomores Hannah Flanders, Emily Hunt, and Jessica Michel. The qualifying members of the 4 x 800 relay team were Caelan, Sarena, Annika, and Brooke. Finally, the girls distance medley relay team of juniors Megan Stafford and Margaret Edgecombe, and sophomores Anna Folkerts and Ziya Xu also qualified. The first year in the new natatorium sparked team growth as many promising and new underclassmen joined the seasoned swimmers to earn the program’s most successful season in many years. The girls went undefeated and were section champs for the first time in 10 years. The boys also posted their best record in quite some time. Also, junior Joslyn Filo broke an old school record of 23.79 in the 50-freestyle with her time of 23.75. In the 100-fly, she timed in at 56.67, besting the previous 25-year-old record of 58.02. Joslyn also represented Fox Chapel Area High School in both events at the PIAA championship. WPIAL girls’ qualifiers: senior Maia Pauley – 200 free, 500 free, 200 IM; senior Megan Wiese – 200 free, 500 free; Josyln – 200 free, 100 free, 50 free, 100 fly, 200 IM; sophomores Maria Luciana – 50 free, 200 IM and Annika Urban – 500 free; freshman Jaclyn Filo – 200 IM, 100 fly, 100 breast; and freshman Grace Gackenbach – 100 back, 500 free, 200 IM. 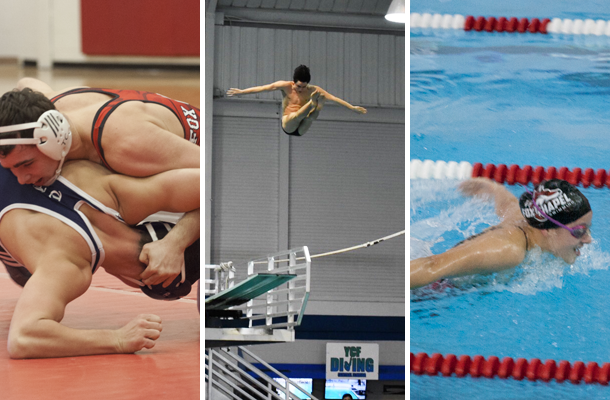 WPIAL boys’ qualifiers: senior Bohan Yao – 200 IM, 100 breast, 50 free, 100 fly, 100 backstroke; sophomore Colin Hackwelder – 500 free; and sophomore Nathaniel Roe – 100 free. Sophomore Jonah Cagley placed third in the state at the PIAA AAA boys’ diving championship with a score of 478.75. He also was the first diver in Fox Chapel Area High School history to win the WPIAL AAA championship. This season, Jonah broke an old school scoring record of 327.10 with a score of 327.50. Freshman Nate Serkov was the first to qualify for the WPIAL championship in the new pool and did it on his first set of dives at his first-ever meet. Besides Jonah and Nate, who placed 11th at the championship, other WPIAL qualifiers were senior Dixon Veltri, and sophomores Katie Eames and Magnus Loeffler, who finished eighth. Senior Mike Mahon was the WPIAL AAA Section 3 champion in the 182-lb. weight class, took third place at the WPIAL championship, and advanced to the PIAA championships. He also earned his 117th career victory, which earned him sixth place among Fox Chapel Area’s all-time-best wrestlers. Longtime coach Ron Frank celebrated his 400th career victory, ranking him third among all current and past WPIAL wrestling coaches. The high school wrestling room was recently named in his honor. Seniors Gabby Badway and Bryanna Urso were honorable mention all-section and participated in the Cager Classic basketball tournament. Bryanna also was selected to play in the Pittsburgh Roundball Classic. Seven gymnasts advanced to the WPIAL championships, including seniors Christina Massalski, Taylor Thiele, and Dixon Veltri, and sophomores Nicole Garcia-Tunon, Rachel Himmel, and Maggie McCoy.